Microsoft wants to help protect companies from hack attacks, and it’s introducing a new Windows 10 feature soon to improve the operating system’s security capabilities. Windows Defender Advanced Threat Protection is aimed at helping businesses deal with serious threats by using machine learning to protect Windows 10 devices. The feature builds a profile of how a computer behaves, and then alerts IT managers if it starts acting in a way that’s indicative of a security breach. If the system detects an attack, it will provide administrators with recommended steps to remediate it. That’s supposed to help IT managers sleep a bit better at night when facing threats powered by undisclosed “zero-day” vulnerabilities, along with social engineering attacks that take advantage of users making mistakes. Terry Myerson, the head of Microsoft’s Windows and Devices Group, said in an interview that the company has found it takes 200 days for an organization to realize that it has suffered a security breach, plus an extra 80 days to get it under control. Windows Defender ATP is designed to cut down on that timeline drastically by letting IT managers know when a machine is acting up right away, so they can better contain any potential damage. 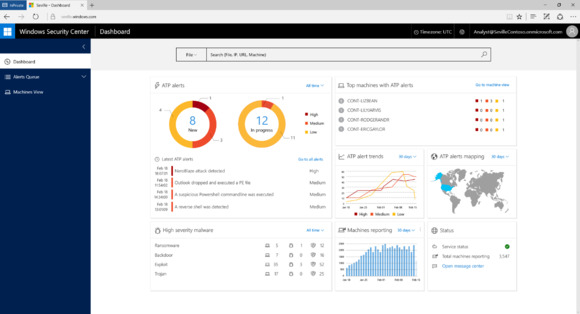 It’s all powered by the same machine learning systems, security analytics and other capabilities that underpin Microsoft’s other intelligent security products like Advanced Threat Analytics and Office 365 Advanced Threat Protection. In the future, Myerson said that the company is looking to add more features like the ability to let administrators automatically quarantine devices that are acting up. Using Windows Defender ATP does require giving Microsoft access to usage data from all of the devices enrolled. Myerson said that all of the information will be acquired in a way that’s not personally identifiable, or organizationally identifiable, but that it’s important the machine learning system behind ATP has access to as much data as possible. “And so, we want to have that machine learning system getting as many of the right signals as possible,” he said. Organizations can also choose not to include any number of devices into Windows Defender ATP, so any machines they want to keep completely under wraps can stay off the grid from the service, so to speak. It’s still early days for the feature. Myerson said that the company hasn’t decided which versions of Windows 10 will be usable with Windows Defender ATP, or what sort of business model will underpin it. Right now, it’s in a private preview with a set number of organizations, securing about 500,000 devices. In the future, the company will make it more broadly available to members of the Windows Insider Program, so they can kick the tires and provide feedback. After those rounds of customer inputs, Windows Defender ATP will be made available to the public—though it’s not clear precisely when that is. Microsoft is announcing it now as part of its push to be more transparent with Windows 10’s features, even if that means it’s being revealed at a time when the company doesn’t have all of the details figured out.